"The Light at the end of the Tunnel"
Could Connect London to New York! in theory, could make it possible to drive from London on one end to New York on the other. The first around-the-world automobile race began with six entrants, starting on 43rd Street in New York City. Their destination was Paris by the way of the The Alaska Bering Strait Crossing. The applications for rail stimulus are in and now the states that applied are waiting on the Federal Railroad Administration's picks for approved projects. We look at the world's five fastest trains—inspirations for the future of high speed in the U.S. The hypothetical project is called the Hyperloop, a high-speed train that would be able to take people to San Francisco from Los Angeles in 30 minutes. That's a speed of almost 800 miles an hour. Elon Musk revealed what he has in mind for his new Boring Company at the TED conference in Vancouver on Friday: a vast underground transportation network beneath crowded cities to complement his electric Tesla vehicles and SpaceX rockets. 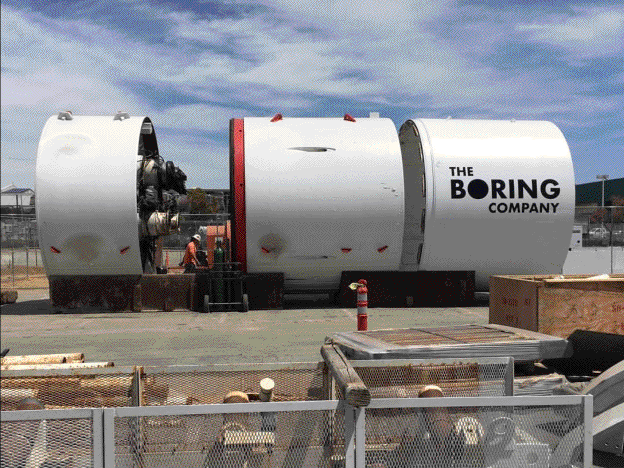 Elon Musk's latest venture, the Boring Company, seems to be making serious progress. The Tesla and SpaceX CEO announced May 12 that the company had begun digging its first tunnel. He also shared photos and video footage of the company's giant tunneling equipment in action. With the Boring Company, Musk aims to build a network of underground tunnels in Los Angeles that would move cars on electric skates. The electric sled would allow for cars to be transported at 125 miles per hour through the tunnel, Musk claims. The company is currently digging a demo tunnel in the SpaceX parking lot. On Friday, Musk said via Instagram that the first full-length tunnel would run from the Los Angeles Airport to Culver City, Santa Monica and Sherman Oaks. Los Angeles city officials did not immediately respond to a request for comment about whether the company had actually gotten approval for such a project. The company's first "Boring Machine" is named "Gardot" and will be several hundred feet long once it is complete. Musk first showed a visualization of how the tunnel system could work in an April Ted Talk. Basically, a car elevator would send the vehicle underground. The car would then shoot through the tunnel on the skate. The INSIDER Summary:China's bullet trains are faster than Amtrak in the US. The interiors of the trains look pretty much the same. Train travel isn't the most popular way to get around in the US. The American Auto Industry put a STOP to Passenger Trains years ago! an the American Airline Industry Teamed up with the Auto companies. it's called Lobby Congress to make a monopoly. Amtrak is the only high speed intercity passenger rail in the country, and it hasn't made a profit since its establishment. The federal government continues to subsidize its operations to the tune of $1 billion every year, and last year's ridership was around 31.3 million passengers - a new record. China's high speed railway, on the other hand, is the most heavily used in the world, with 1.44 billion passengers every year. Ridership isn't the only difference between these two railways - here's how they stack up. THE BUCK STOPS AT THE TOP . . .